Monday, May 15, is Peace Officers Memorial Day, a special opportunity to remember the sacrifice and commitment of our nation’s law enforcement officers. To celebrate, we’re sharing stories from American Police Beat’s Cynthia Brown’s book, Brave Hearts: Extraordinary Stories of Pride, Pain and Courage, about heroes who paid high prices while serving and protecting their communities. Today, we’re bringing you the story of NYPD Sgt. 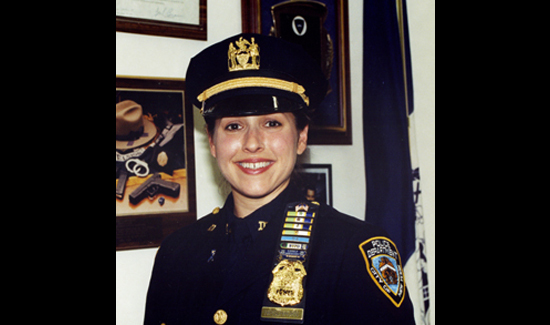 Stefanie Hirschhorn Mount, who shares her experience overcoming the trauma of losing a fellow officer in a line-of-duty death. The close relationships make line of duty deaths particularly traumatic. “When it’s in your own command, it’s losing someone in your own family,” she says. Stefanie was in Street Crime when one of her co-workers was killed. Years have gone by but she says she is sure everyone who knew and worked with Kevin Gillespie remembers exactly where they were and what they were doing when they heard the news he had been shot. It was around nine in the evening. The date was March 14, 1996. Kevin and his partner that night, John McGreal, were patrolling in the Bronx when they pulled over a BMW that had been car-jacked. When the officers got out of their car, several men in the BMW jumped out of theirs. They all were armed. Angel Diaz began firing a 9-mm handgun at the cops. One bullet hit Kevin in the shoulder, just above his vest. The autopsy revealed that the round had gone straight down his body. John chased the suspects down the Grand Concourse all the while exchanging gunfire. Two off-duty officers on their way to work rushed to help and one of them was shot in the neck. Three bystanders were wounded including a forty year old woman and two fourteen year old boys. A search of the area by NYPD bloodhounds and scores of Emergency Service officers continued into the morning until the suspects were all in custody. The men who took Kevin’s life were members of a violent street gang known as the Park Avenue Boys. Even though they did not fire the gun that killed Kevin Gillespie, Ricardo Morales and Jesus Mendez were convicted of multiple counts of racketeering and two murders. They are serving life sentences without possibility of parole. The man who shot Kevin Gillespie, Anthony Diaz, was charged with capital murder, but he hung himself in his prison cell on September 5, 1996. “Kevin had just turned thirty four and his sons were young,” Stefanie said. “The feelings are hard to explain to someone who’s not a cop, but the grief and sadness is always with you. Kevin’s dying didn’t make me afraid to do my job, but it changed me forever. Over and over you keep asking yourself why weren’t you there to help ? Why didn’t he wait for us to get there? Why didn’t the bullet hit his vest? Why? Why? Why? Stefanie remembers Kevin’s funeral. “There was a moment I will never forget,” she said. “I was with Kevin’s family in a limousine, driving to the church for the funeral. We had the windows in the back seat of the limousine rolled down. One of his two young sons pointed out the window at all the officers lined up along the street. ‘Look at all the polie-cops who love my Daddy,’ he said. I will never forget that he couldn’t pronounce the word ‘police.’ He started counting them as we passed. It was heartbreaking. Out of the blue that four year old boy asked our PBA delegate, ‘Were you there when my Daddy got killed?’ Did my Daddy get shot right here?’ He was pointing at his heart. She sat there dumbfounded as she looked at the rapidly transpiring events on her television screen. She tried to call her brother in California to tell him she was okay. Then she called her doctor and told him she was going to work. Despite his protestations, she got her pills and drove into the city. What transpired during the days following the attacks are confused in her mind and Stefanie is not quite sure when she learned that Steve Driscoll was missing. It might have been September 11, it might have been a couple days after. She was in the 44th precinct up on the second floor when someone called with the news. She remembers her whole body shaking. She cried out, “No. It cannot be. We’ll find him. He found a little air-pocket to crawl into. I know Steve. I know we are going to find him. I know he’ll be safe.” She slid down the wall in the hall, laid her head down on her knees and sobbed.